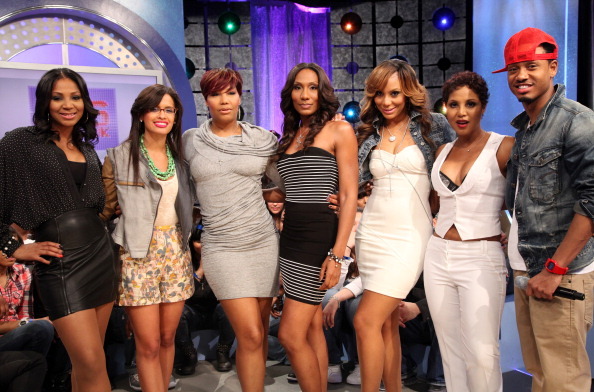 (L-R) Trina Braxton, '106 & Park' co-host Rocsi, Traci Braxton, Towanda Braxton, Tamar Braxton, Toni Braxton, and '106 & Park' co-host Terrence J. visit BET's "106 & Park" at 106 & Park Studio on April 11, 2011 in New York City. *Toni Braxton, 43, is squashing rumors that she has a cougar thing going on with “106 & Park” host Terrence J, who is all of 29. Toni set the record straight when cameras caught up to her last night in Hollywood. She also took to her Twitter recently to deny they’re dating.